Welcome to the Worthing Podcast! As of August 2018 the Worthing Podcast is taking a break. An archive of the most recent podcasts is here, and earlier ones are still available if you Contact Us. Welcome to the website of the Worthing Podcast. We’re working in partnership with Worthing Theatres, and feature a monthly rundown of what’s on in the theatres. We also go round the town talking to people who make Worthing a great place to be! Look out for us at local events. Listen to the podcasts by going to the Audio Podcasts page. You can follow us on Facebook, and subscribe on Audioboom and iTunes. 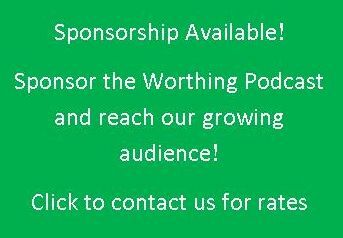 If you are interested in advertising on the Worthing Podcast site, please contact us. We are happy to accept a small number of banner ads but do not wish to overdo it! We would value your comments too.